I have started having little chats with Cooper and Zoe about the impending change to their lives. I am a little concerned about how they are going to react. Cooper will either become the babies greatest protector or he will eat it. With Zoe, I am worried she will pee on the baby as that her solution for anything that smells funny:) I think Cooper is beginning to sense that a change is on the horizon. He has always been Allen’s little boy, but the last few weeks he has been much cuddlier with me. He sits on the back of the couch and instead of completely ignoring me, he looks knowingly at me and whispers a meow. The other day he also spent a few minutes rubbing his head on my belly. We shall see what happens come the end of November. One thing is for sure, we will be getting a crib tent. Otherwise Cooper will be spending all his time in the crib….he likes to sleep in crib like places. I am also sleeping a lot better than I was month ago. I actually have a little more energy when I get home from work. I am now 16 weeks pregnant. A lot of people tell me they think I am having a boy, but we will have to wait a few more weeks to find out for sure. Allen and I are definitly having a much easier time thinking of potential names for a boy. We can’t come up with a girls name for the life of us. Over the last week, I have been more into stitching again and I am looking forward to cranking out Jenna’s summer dragon for our RR this weekend. I can definitely make baby out in the photo. :0) I guess there is no way of knowing how Cooper and Zoe will react – cats can be so unpredictable. Hopefully having a new family member won’t upset them too much. I think it’s also about the quality of the ultrasound picture: that’s best I have seen. I hope Cooper and Zoe will think the baby as a kitty they need to look after for. Aww cute pic. The kitties will know you are having a baby. In fact that was what made me first suspect I was pregnant. My kitty started giving me so much attention and followed me everywhere – as if she was protecting me. It was really strange and she’d only done it once before (when I was pregnant in 2003). I miss being pregnant :o) Enjoy yours. Have you felt any movement yet? That is just the best! All four of mine looked the same on ultrasound as when they were in my arms! 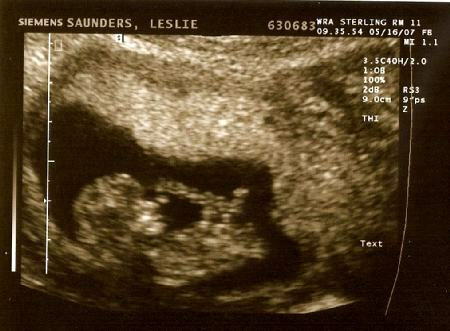 Funny that you said that everyone thinks you’re having a boy, because as soon as I saw the ultrasound, I thought boy. I’ve got a 50/50 shot of being right, right? Yup, definitely a baby in there! Have you decided if you’re going to stitch anything for him or her yet? I am soooo glad you are starting to get your sea legs back again! Your little one is looking so precious already!! Yes, Zoe and Cooper have some adjusting to do soon!! Glad you’re feeling better and able to stitch. How exciting to see your ultrasound! Glad you are feeling better:) I’m sure Zoe and Copper will do fine when the time arrives. Congrats on the new addition! I’m sure Zoe and Cooper will adjust to the new arrival. Glad to hear that you’re getting a little more sleep these days! Our cat was a very spoiled kitty before DS came along. She did find his arrival stressful and actually went through a period of fur-loss. She recovered though and is fine these days (although her favourite time of day is *clearly* when DS goes to bed lol). How sweet of you to share your first baby pictures with us. Glad to hear you are a little less tired and sleeping much better. This is such an exciting time for you & DH – Enjoy!! Awww, that’s so sweet! Glad to hear you’re feeling better.